The BookMobile is a library on wheels containing an expansive catalog of items in every category you might find at any branch library, transporting materials and resources to Madison County communities. This includes bestsellers, DVDs, music CDs, children's materials, and large-print books, just to name a few. 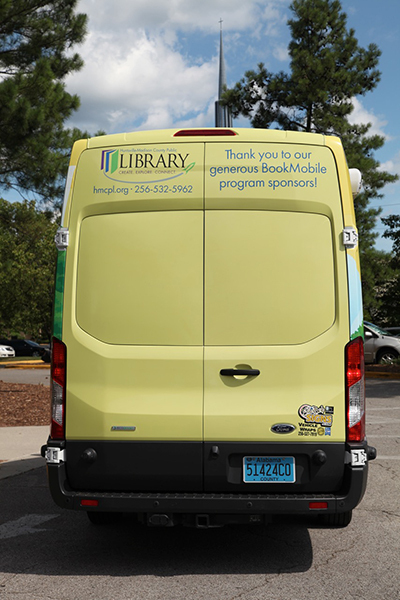 Thanks in part to a grant provided by the Institute of Museum and Library Sciences (IMLS), this BookMobile is a brand new 2015 Ford Transit. But this isn't any normal van. Our BookMobile is customized with traveling shelves, a ramp for easy loading and unloading, a retractable awning for providing shade, and mobile Wi-Fi. If you see us out and about, let your friends know on social media and share with us on Instagram by using the hashtag #LibraryOnWheels. 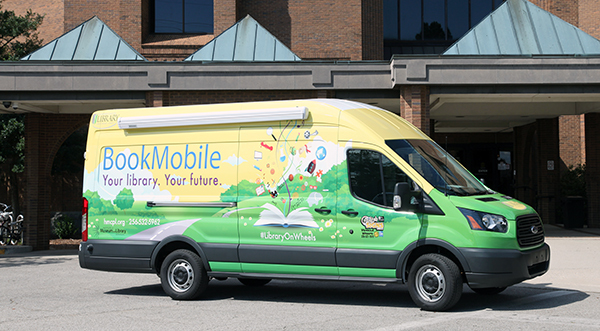 Please contact the Outreach Department at 256-532-5962 or outreach@hmcpl.org if you are interested in scheduling a BookMobile visit for your community group within Madison County. In order to provide books and other materials for the communities the BookMobile visits, we depend on sponsorships from local businesses. In exchange for your sponsorship, we will display your company's logo on the back of the BookMobile. Let the communities in Huntsville, the City of Madison, and Madison County know you support literacy and the Huntsville-Madison County Public Library by sponsoring the BookMobile today. If you are interested in becoming a sponsor, please contact foundation@hmcpl.org. Huntsville-Madison County Public Library thanks Shabob Signs, Inc. of New Market for providing the beautiful vehicle wrap free of charge. Shabob Signs, Inc. has ensured our BookMobile will be recognized throughout Madison County, and their generosity in sponsoring the wrap allows more funds to go to the collection.